Since their introduction last October, Apple's new MacBook Pros have been the subject of a slew of criticism from consumers all over, complaining about the lack of full-sized USB ports, built-in media card reader, and deficient battery life have spelled frustration, if not outrage, among Mac power users. Two third party solutions are targeting some of these problems. The first from component supplier OWC adds functionality to the MacBook Pro using a dock-style extension. It's called the DEC and is essentially a slab that clips on to the bottom of the laptop to add an SD Card slot, two USB 3.0 Type A ports, and an Ethernet jack. It can also be used to attach up to 4TB of additional flash or SSD storage. As you'd expect, there's a (big) caveat -- you're going to need to sacrifice the reduced thickness and weight of your new MacBook Pro. The DEC measures in at approximately 0.6-inches, so when it's affixed, you'll be carrying around a machine that's almost an inch thick. OWC has yet to disclose details about pricing and availability, but the DEC will be on display at CES this week. It’s kind of an ugly solution, but one that may work effectively to attach the MacBook while sitting on your desk, and detaching when you’re on the go. The second is a portable adapter and a much nicer solution overall. Called the HyperDrive, this Kickstarter project opened in December and has already passed the million dollars in founding among 12,000-plus backers, proving how popular Apple’s laptop line is and how users are complaining for good reason, they actually need these ports today -- whether they’ll need them a year or two from now is an entirely different question. 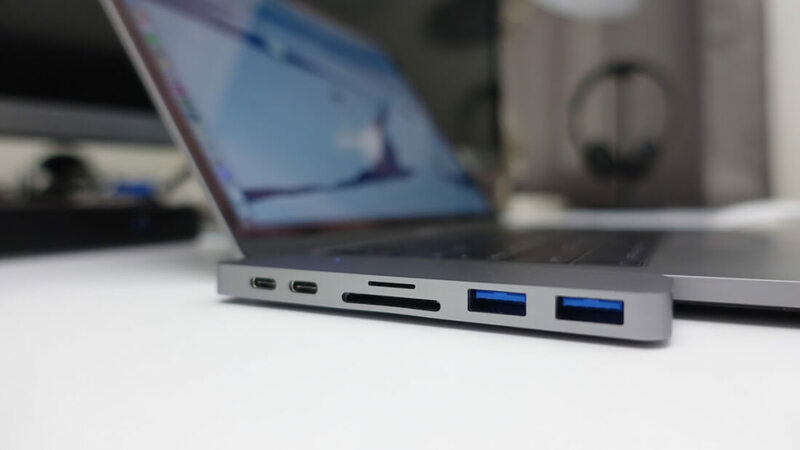 The $69 HyperDrive is slated to ship in March, it plugs into two USB-C ports on one side of the MacBook and in exchange you get the same two USB-C ports plus HDMI, SD and microSD card readers, and two USB 3.1 ports.